In saucepan, combine sugar, flour and salt. Gradually stir in milk, cook and stir over medium heat till mixture thickens and boils. Cook 2 minutes longer. Remove from heat. Stir small amount of warm mixture into egg yolks, add to mixture. Return mixture to heat, cook 2 more minutes, stirring constantly. Remove from heat, add butter and vanilla, cool to room temperature. Pour into baked pie shell. Merange: Beat 3 egg whites with 1/4 tsp cream of tartar and 1/2 tsp vanilla till stiff peaks form. Gradually add 6 tbsp sugar, beating till stiff peaks form and all sugar has dissolved. Spread on top of pie filling, sealing to pastry. Bake in 350 degree oven till merangue is golden. 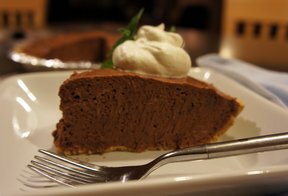 For Chocolate Pie: Increase sugar to 1 cup, chop 2 one-oz square unsweetened chocolate and add with milk. 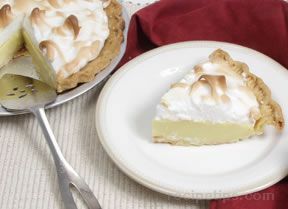 For coconut cream pie: Add 1 1/2 cups coconut (flaked) to pie filling. Sprinkle coconut over merangue before baking.